Back in 2012 I bought a handful of Soviet silent classics by Vsevolod Pudovkin, Boris Barnet, Yakov Protazanov and Aleksandr Dovzhenko from the French DVD publisher Bach films. Overall, the digital transfers of the films which can be found on these DVDs are of a very varying quality: sometimes they are pretty decent, while other times the image is fuzzy leaving no doubt that the transfer has been made from a VHS source of very dubious quality. In spite of this, the DVDs are quite interesting and come highly recommended. They always contain interesting extras; rare shorts of the mentioned directors, television documentaries on the directors and actors (especially the release of Protazanov’s Father Sergius (1917) which contains the excellent documentary on actor Ivan Mozzhukhin’s life and career in Paris, Ivan Mosjoukine ou l’enfant du carnaval (Galina Domatovskaia, 1999)). In addition, the DVDs – at least when found in shops and not online – are usually in the price range of three euros which makes the personal economic casualty of buying a DVD with a bad transfer of a hard-to-find film quite bearable. 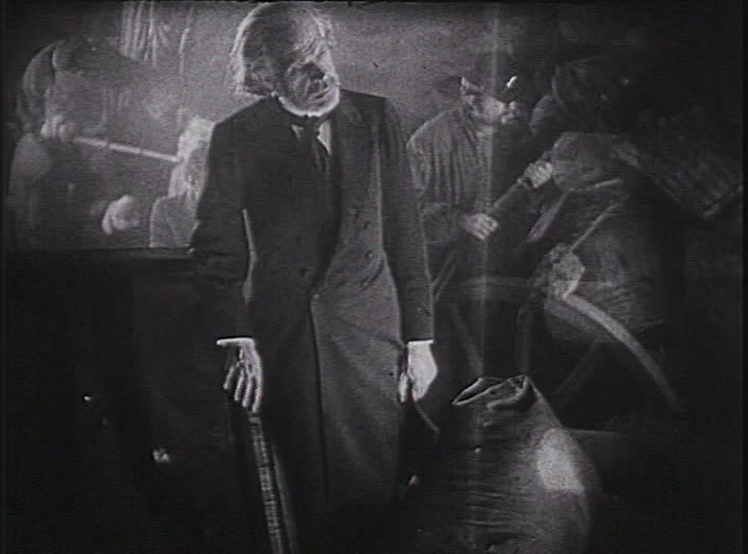 But there are also more unforeseeable effects to be experienced when looking at these films in these particular editions – looking is meant here in the sense intended by many film preservationists who tend to ignore content or story, while paying attention to a film’s material properties. Poor digital transfers is of course the result of carelessly supervised transferring and this leaves room for some artifacts within the image of several of these films which the most neatly restored versions of film classics from other DVD companies such as for example the Criterion Collection and Masters of CInema would probably never leave in there. Often I have witnessed artifacts which were printed- in, in the film copy to then remain in the digital transfer of a film: of course cue dots from 35mm prints which is quite common to encounter but also more interestingly, on the Bach films editions, sprocket holes appearing in the midst of the frame running over the screen. 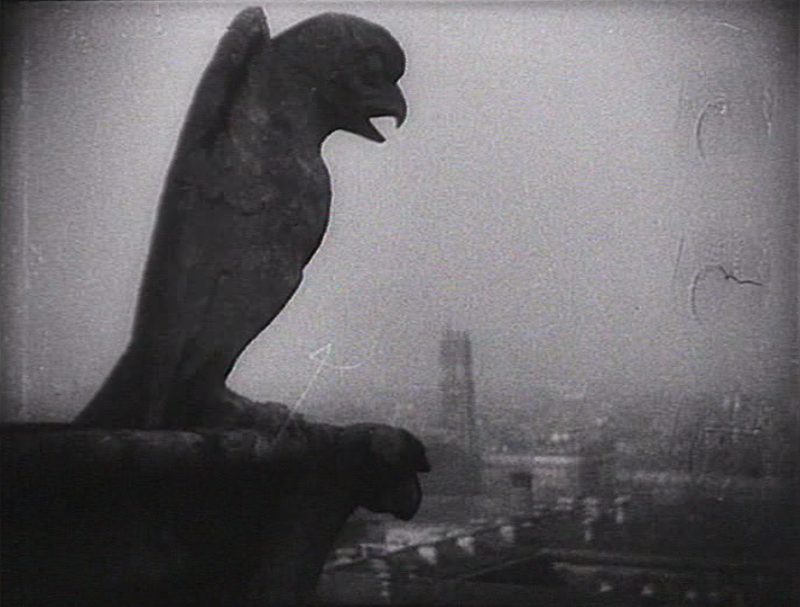 The effect created by the latter type of artifacts was particularly striking and peculiar when I watched the edition of The New Babylon (Grigori Kosintsev and Leonid Trauberg, 1929), an effect which I cannot recall ever experiencing in my career as a DVD aficionado. 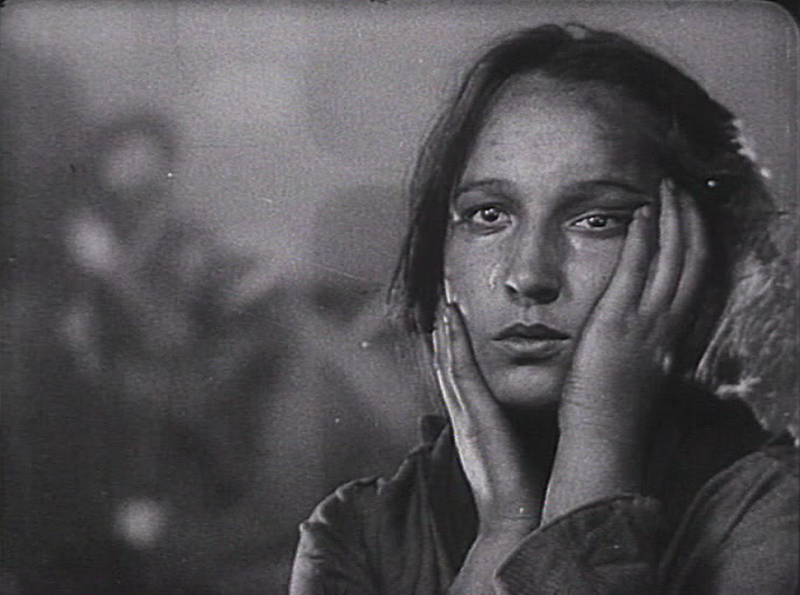 It could be said to add a material reflexive dimension to this classic silent film, which depicts the fall of the Paris Commune in 1871, centering on a troubled love story between two individuals on each their side of the conflict between the commune and republican France; a doubting soldier and a militant woman. 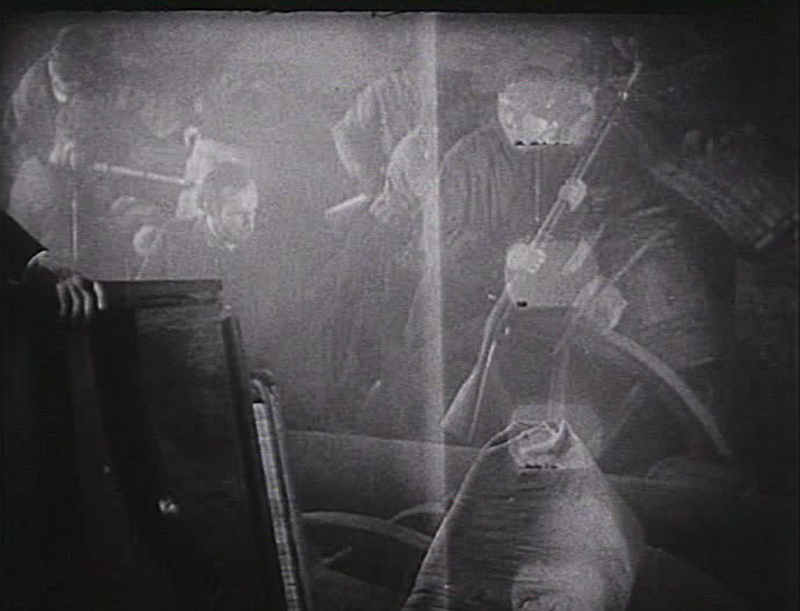 The transfer had quite evidently been made from a VHS, but nonetheless it was clear that these printed-in artifacts had remained in the frame, very far from where they should be in this type of film. Curiously, I registered that the presence of these artifacts reached its highest intensity in the film’s climactic scenes when the Paris Commune falls. All of a sudden, sprocket holes appear in the midst of battle scenes, while the troubled lovers stare at them running over the screen. This made the film appear as anything but a silent classic, but rather a materialist film in the vein of 1960s and 1970s structural filmmaking such as George Landow’s classic Film in Which There Appear Edge Lettering, Sprocket Holes, Dirt Particles, Etc. (1966), or more recent found footage works such as Peter Tscherkassky’s Cinemascope Trilogy (1997-2001), especially actress Barbara Hershey’s heroic fight with sprocket holes and optical soundtracks in Outer Space‘s (Peter Tscherkassky, 2000) flickering climax. This accidental analogy made me think that, while slickness and clean images usually are the first things many would associate with digital imagery – and especially digital transfers – the reality of digitisation is much more complex, and sometimes as in the case of Bach films transfers can induce involuntary reflection on the materialities of film in the digital domain. While one could ponder at length about the deontology and ethics involved – or rather lacking – in such transferring practices, I prefer to think of them in this case – and with a touch of irony – of an accidental material reflexivity which can invite further interrogation and reflection on what the transition from analog to digital implies for our experience of film classics and archival films. I have made a couple of screen captures – a feature of the digital viewing experience which enables me to indulge in this phenomenon – which I include here below. The characters in these shots are thoughtfully looking toward the perforations, to the right in the first example, almost in an angelic manner in the second, slightly confused in the third and (perhaps) perplexed in the fourth. This entry was posted in Digitization, Film Heritage, Film History, Found Footage by Christian Gosvig Olesen. Bookmark the permalink.